I was raised Catholic, and though I firmly identify as “lapsed,” I definitely have a huge soft spot for any media that deals with Jesus, the Church, or the clergy. 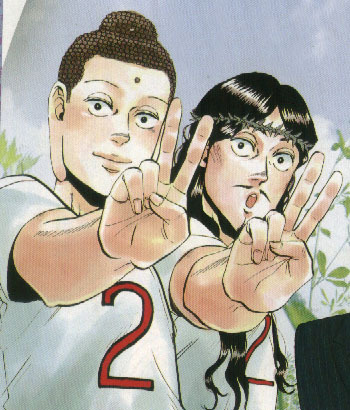 I was, therefore, very excited when I discovered the existence of Saint Young Men. Picture this: Jesus Christ and Gautama Buddha decide to vacation together on Earth – in Japan, of all places. The story, which started out as a manga by Hikaru Nakamura and has since been adapted into a 2-episode OVA and a movie, chronicles our holy heroes’ little everyday adventures. What it lacks in plot it makes up for in charm, because the appeal is chiefly just the premise of two intimidatingly holy men chilling out and taking a vacation. Gags involving over-bright halos, depression-driven stigmata, walking on water, and fasting ensue. Making jokes at the expense of major religions makes some people extremely uncomfortable, and at its worst it can be construed as sacrilege. 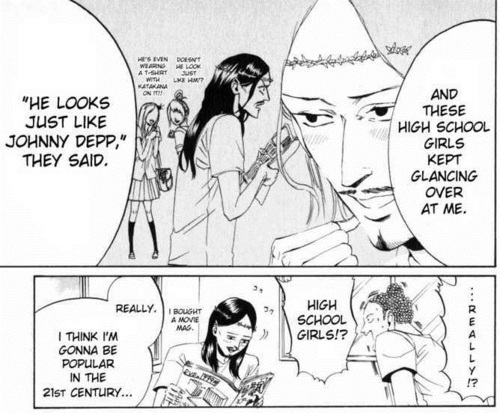 For my part, I believe that any faith should be reasonably willing to accept a little humor into their practice, and the humor contained in Saint Young Men is done in as respectful a way as possible. Buddha is certainly characterized as being very holy and his history as an ascetic is central to his personality. Jesus, interestingly enough, is the more laid-back prophet in this little duo. He shamelessly reviews television dramas on his blog, he becomes flattered when high school girls at the convenience store think that he’s Johnny Depp, and he’s a little frivolous with money. Read right to left, please! At first, I was really surprised with this Jesus who would spontaneously turn things into bread when he was really happy. But the more I’ve thought about it, I’ve realized that the Japanese have a lot more context for the holiness of Buddha than they do for the holiness of Christ. As I’ve mentioned in the past, Japan isn’t known as being a very Christian country, and Jesus’s exploits and suffering don’t really seem very different from Buddha’s out of context. Buddha has the benefit of having influenced the culture far sooner, so his face and his personality are linked more readily with the concept of sainthood. That all being said, I like the concept of a happy Jesus – the prophet who loves puns, the man who calls on Peter to ask about acceptable housewarming gifts, whose tastes are more varied than those of his partner. There is something very honest about this interpretation; I always felt that Christ was actually pretty fun-loving and amicable, and if the situation during his lifetime had been different, maybe he would have had more of a chance to express that side of himself. A man who preached love couldn’t always be serious and business-oriented. In any case, it is very gratifying to watch as this holy duo spends their day-to-day life. They are humanized, and though many could assert that it stinks of sacrilege, I firmly believe that being able to relate to your leaders, whether they be religious, political, or otherwise, is a very important facet of supporting a cause. Regardless of what you believe, it is hard to argue against the immense importance that Jesus and Buddha had and continue to have to this very day. Truly, they are great men who underwent a great deal of suffering for their ideals. I think Nakamura-sensei has done them a great service by allowing them a well-deserved vacation in Saint Young Men. 3 thoughts on "Have You Heard About Anime Jesus? 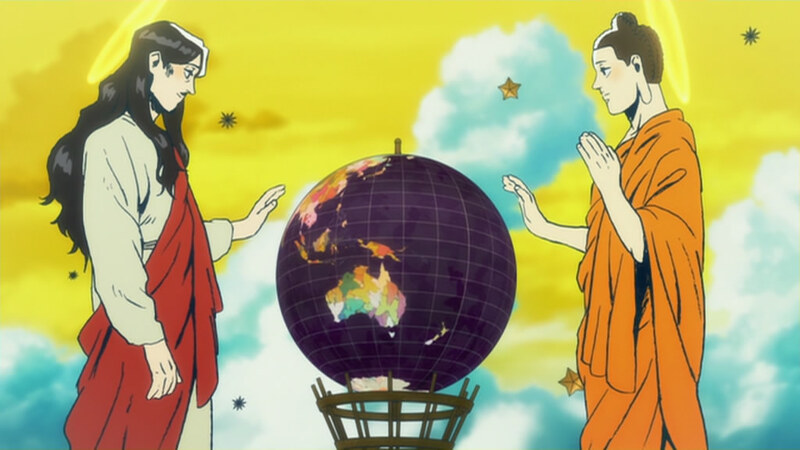 : A Saint Young Men Review"
Not gonna touch this one with a ten-foot pole, Morgana 🙂 But I do thank you for bringing it to my attention! On the same topic, did you know that Jesus is buried in Aomori?